I have started a new blog. This will be the last post here. I thank you all for your interest! It's been a fun and interesting time. I also thank you for all the nice comments (that often come to my message box on Ravelry!) You're still welcome to comment there. See you! I hope you all will go on following me here: Barbro's Threads. 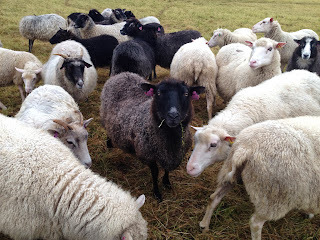 A few weeks ago I met a sheep farmer who breeds not only for meat, but also for wool. 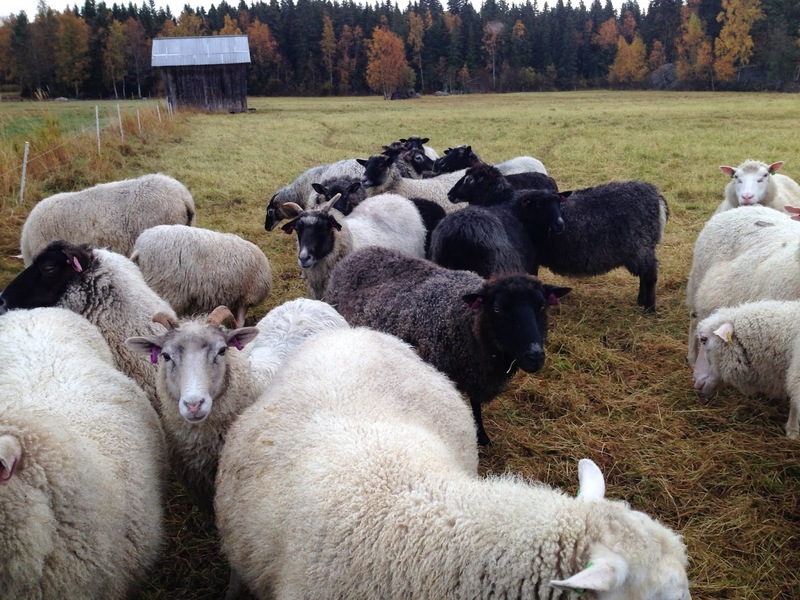 She has Åland sheep and Finnsheep, two of the native breeds of Finland. Today I had a chance to take photos. 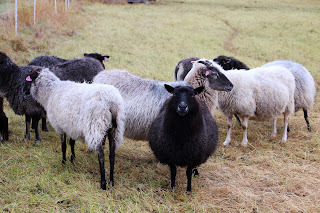 The farmer was busy elsewhere, so at first I was afraid I'd scare the sheep. But no! They only came closer and closer, and the camera lens I had chosen soon proved to be the wrong one. I had to pic up the phone for close ups! Here they come! "Who are you?" they said. The white Finns are bigger and stronger than the small Ålands. And look at it's face! She's a little lovely devil :) Our Kasper got upset and wanted to fight, so he had to stay in the car and seemed quite content with that. So now I'll wait for a few weeks, then it'll be time for wool scouring again. I have now doubt it'll rain the next weeks because it's that time of the year, and the sheep will get dirty, but on the other hand, the wool will be longer. In the mean time I will be busy with a few samples of wool from Estonian Native Sheep, and with Kainuu Grey and a few other breeds. On the way home we had a glimpse of some 40 people fishing from the big bridge between the archipelago and the main land. They seemed to be just as happy as the sheep, but for other reasons. They had coffee and sandwiches on the parking ground, and it seemed some of them even caught a Baltic herring or two :) Those herrings are the best you can get, it's gourmet food, fried in a pan in butter and eaten with rye bread. I have been making faux rolags. 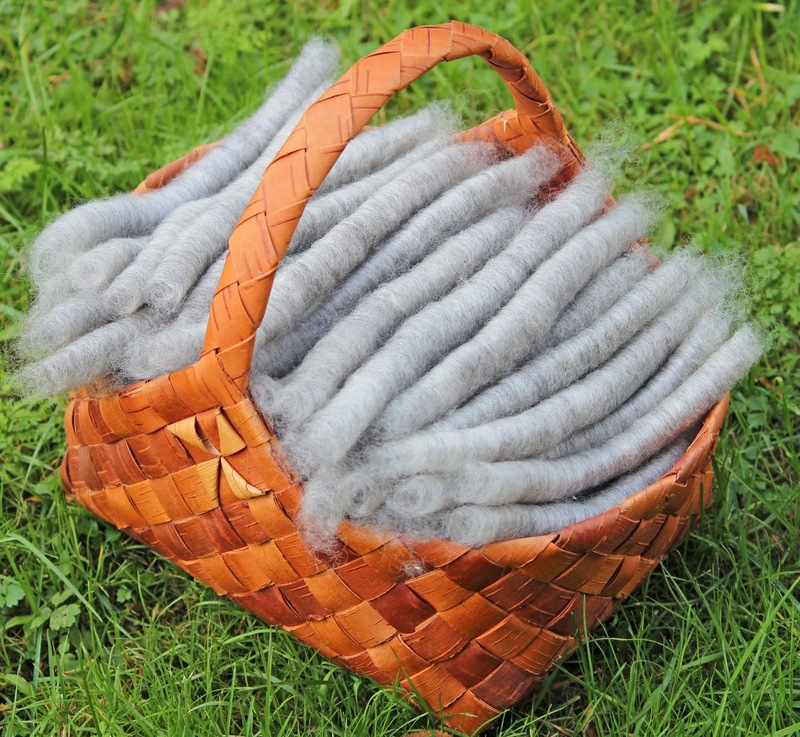 The wool is Kainuun Harmas, Kainuu Grey, a rare Finnish sheep. 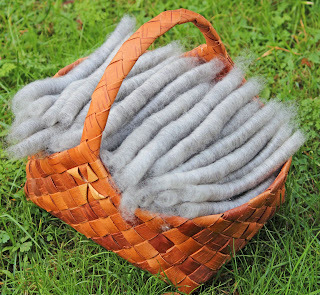 It's traditionally been used for fur clothes, but now the wool is mostly spun into yarns. The sheep are naturally grey, with shades from almost white to dark grey. The lambs are black. I love the color! I also love the loftiness of false rolags. They are so easy to spin! After days and weeks of combing, carding, and rolling, you can sit down and just enjoy. I've also been knitting, and now I'm a bit afraid the pants and the cardigan are too small. The little girl has grown so much! If she's too big, she better have a sister soon. Did you hear that, Malin? 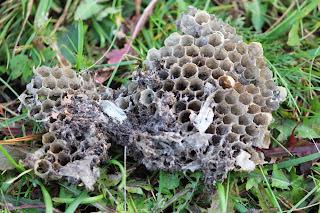 Their nest has been destroyed. I wonder who did that? Or is it the normal thing in the autumn, because they die and only the queen survives. 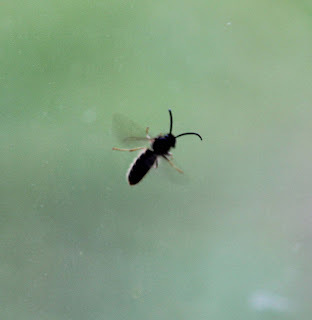 I know very little about wasps. We help them to find their way out, but not all of them are co-operative. It works really well. It's much faster and easier to spin cotton on the bobbin winder than on any other of my spindles or wheels. Attaching a bobbin and a quill makes it a real spinning machine! I'm sure you can spin any short fibers with it. The bobbin is from Ashford. I use them as storage bobbins for my spun singles, and I also have bigger ones from Schacht. 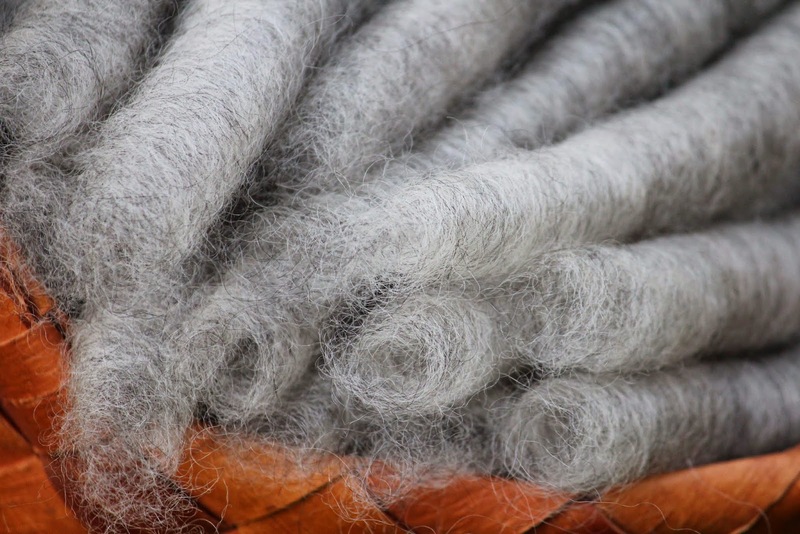 Many of you may have bobbin winders and bobbins, so start making you own spinning machine! The quill can be anything that fits into the bobbin and has one sharp end. I made mine from a piece of wood I had lying around, only needed my beloved Swiss army knife to fix it. You can finish it with sandpaper if you want, I didn't, as you can see. It works splendidly anyway.